In Early Years, many children will draw support from their nursery community and key-worker. However, we value the importance of the team around the child. We believe a child’s network of support will almost always have at its heart, their parents, carers and family. The child’s team will also consist of the universal services of health and education and in some cases, other services. In response to this, we have ensured that GIRFEC is the strong spine running through all of our policies and practice guidelines. 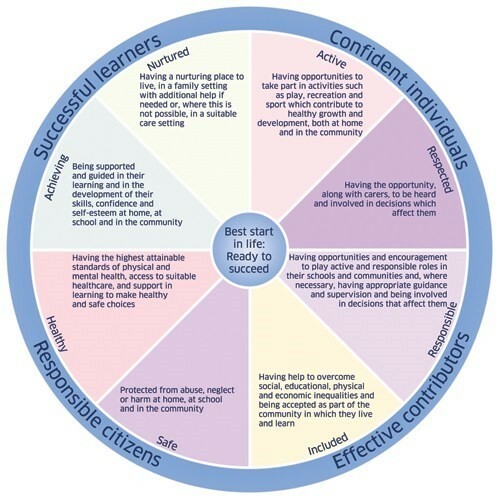 We are therefore committed to ensuring that the eight areas of wellbeing are considered for all, within our Nursery communities. This will respect everyone’s rights; children, families, staff and partners and in turn, will ensure the child’s wellbeing remains at the heart.